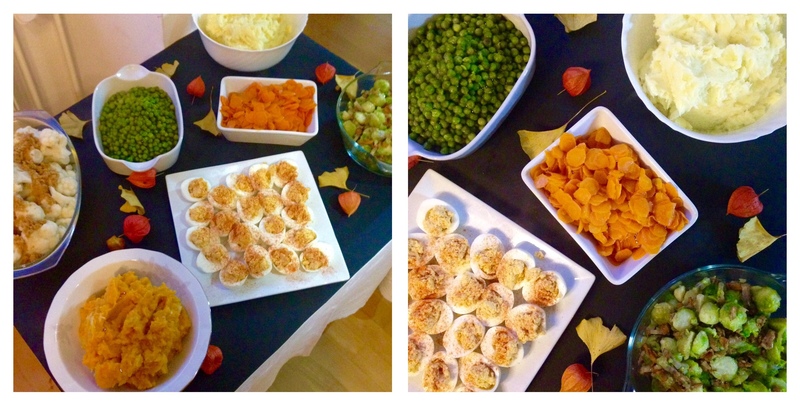 Yesterday, my family and I celebrated our third Thanksgiving. As a holiday, Thanksgiving is celebrated as a day of giving thanks for the blessing of the harvest and of the preceding year. it has it’s roots in English traditions and has aspects of a harvest festival. According to Wikipedia, the modern Thanksgiving holiday tradition is commonly, but not universally, traced to a poorly documented 1621 celebration at Plymouth in present-day Massachusetts. The 1621 Plymouth feast and thanksgiving was prompted by a good harvest. In modern times the President of the United States, in addition to issuing a proclamation, will “pardon” a turkey, which spares the bird’s life and ensures that it will spend the duration of its life roaming freely on farmland. In the United States, Thanksgiving is celebrated on the fourth Thursday of November and that is the day we celebrated it too. 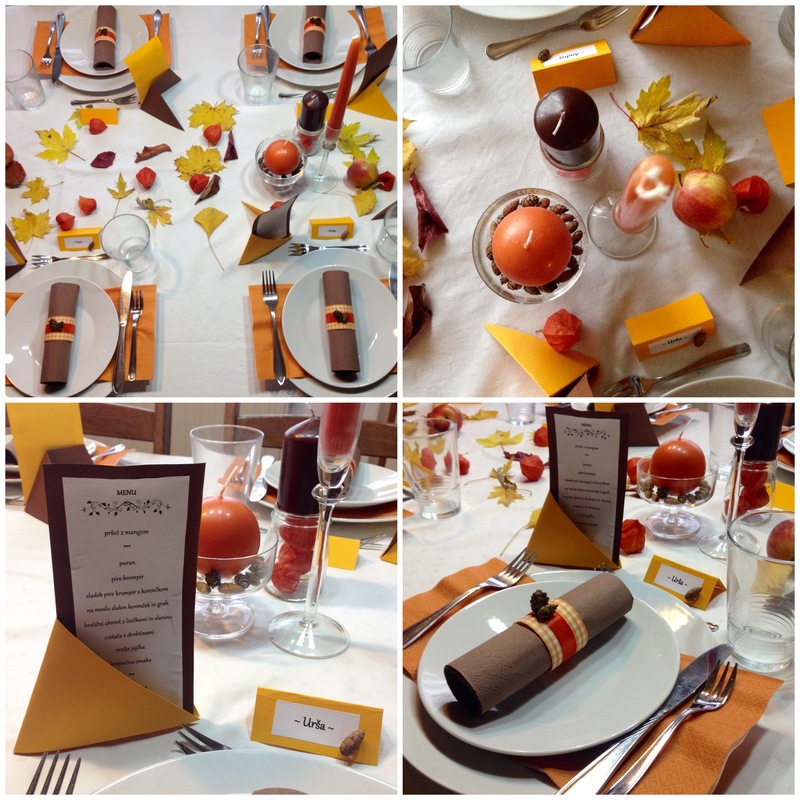 I also spent a few days planning our table decoration and made most of the decorations myself, either from scratch or I just found them in the amazingly colored Autumn nature. 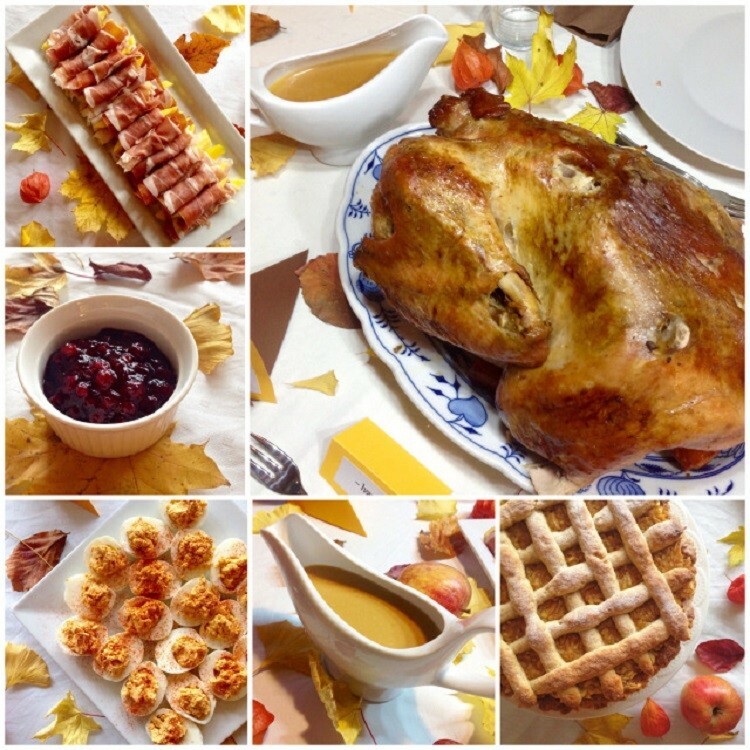 You can easily prepare all of the below dishes for Christmas dinner as well. If, like most of us at home, you only have four cooking plates and one oven, you will have to do a bit of planning as to which dish to make first. I suggest you bake the pie first and this way have the oven reserved for the turkey for the rest of the day. Cook the eggs, carrots, green beans and Brussels sprouts first, since you will be serving the eggs cold and you can reheat the vegetables. Cook the potatoes and cauliflower last, since you will be serving them hot. All of the below dishes are really homely and easy to make, so don’t be scared. You can make a feast for your family even if cooking is not one of your favourite things to do. 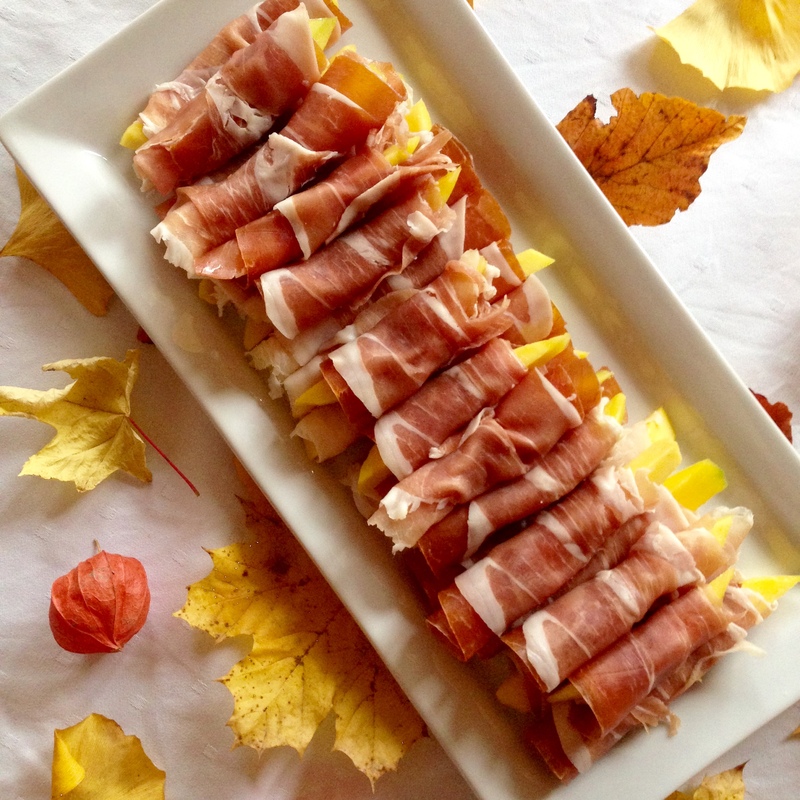 For appetizer, I suggest making Mango & Prosciutto Wraps. Prosciutto is usually served with melon, so twist things up a little and serve it with mango. Simply peel the mango and cut it into long strips, wrap them in prosciutto and serve. Since you want your guests to still be hungry after the appetizer, I suggest a serving of three per person. Roasted Turkey is the part of the dinner that will take the longest to prepare. A simple rule would be, that you should roast your turkey for an hour for each kilogram. 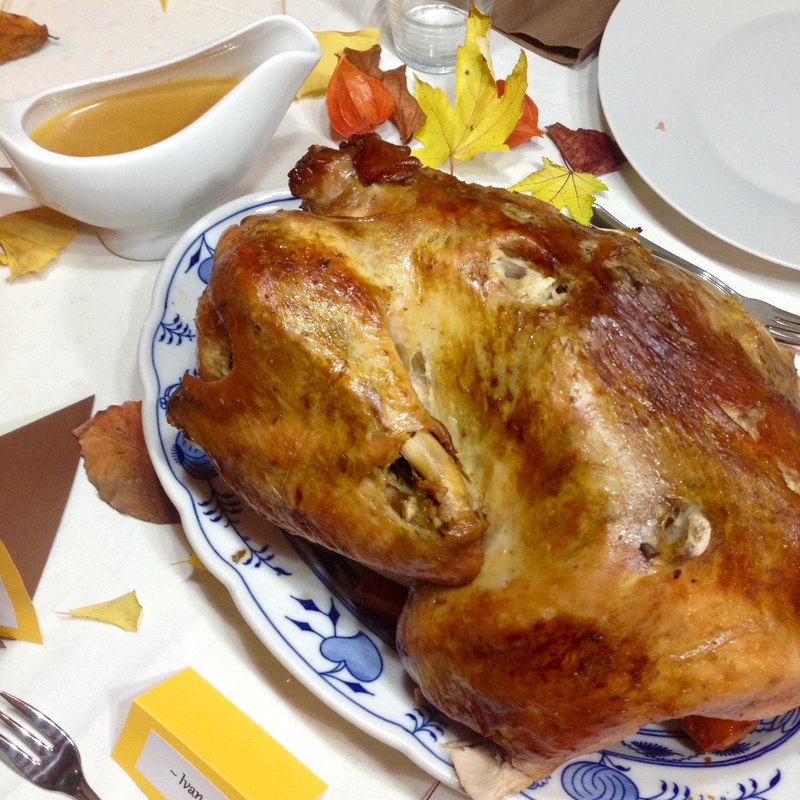 I roasted a 4,5 kg turkey for 8 people and had plenty of leftovers – another one of the great Thanksgiving traditions – for today. I kept it really simple with regards to seasoning. I simply salted the turkey from the outside and the inside and placed in a deep roasting pan together with some apples and carrots (see Gravy below for details). I prepared about half a litre of vegetable stock to pour over the turkey every 20 minutes. Preheat the oven to 180 degrees Celsius. Roast the turkey, covering it with some vegetable stock every 20 minutes. You can add some butter once or twice as well. The rule is to bake the turkey breast side down for 3/4 of the time and to turn it over for the last 1/4. You might have to cover the turkey with aluminum foil or baking paper after a few hours and/or reducie the heat to about 160 degrees Celsius to prevent the turkey from burning. I ended up baking my turkey for about 4 hours. Everyone has their own version of the Mashed Potatoes recipe. It’s usually a “how your mother used to make it” thing. There is no rule as to how to make you mashed potatoes. Just peel and chop 2 medium potatoes per person if you will be serving only regular mashed potatoes or 1 medium potato per person if you will be having other sides as well and cook them for about 20 minutes after bringing the water to a boil. Drain, add some butter and warm milk and mash, mash, mash. To make the Sweet Potato and Carrots Mash, simply peel a large white sweet potato and 5 – 6 medium carrots and chop them. Place them in a medium pot of salted water and bring to a boil. Cook for about 20 minutes or until the carrots are soft (it takes longer to cook the carrots than the potatoes). Drain and follow the instructions for regular mashed potatoes. Alternatively, you can use orange sweet potatoes (these are the ones I usually use but I couldn’t get them in stores this time). That way, you can use more potatoes and less carrots and will still get the perfect orange color of the mash. Carrots and Green Beans on butter are really simple to make. Just place four tablespoons of butter in two large pots, two tablespoons each, and add 600 grams frozen green beans in one and about 1 kg of sliced (best done using the mandolin slicer) carrots in the other. Slowly cook until soft and serve warm. You can find the recipe for the Brussels Sprouts with Bacon and Chanterelles in one of my previous blog posts. For the Cauliflower with Bread Crumbs, cook the cauliflower to desired softness and place in a bowl. Melt a tablespoon or two of butter, add white bread crumbs and cook until golden brown. Cover generously over the cauliflower. I have been told (and have also seen in the movies) that typically, Americans serve their side dishes on a separate table, allowing for the guests to choose their favorite and return to the table where the head of the family serves them the turkey. This year, for the first time, I decided to follow that tradition as well. I turns out to be very practical due to the number of different side dishes and the fact that table decorations and the turkey took up most of the main table. 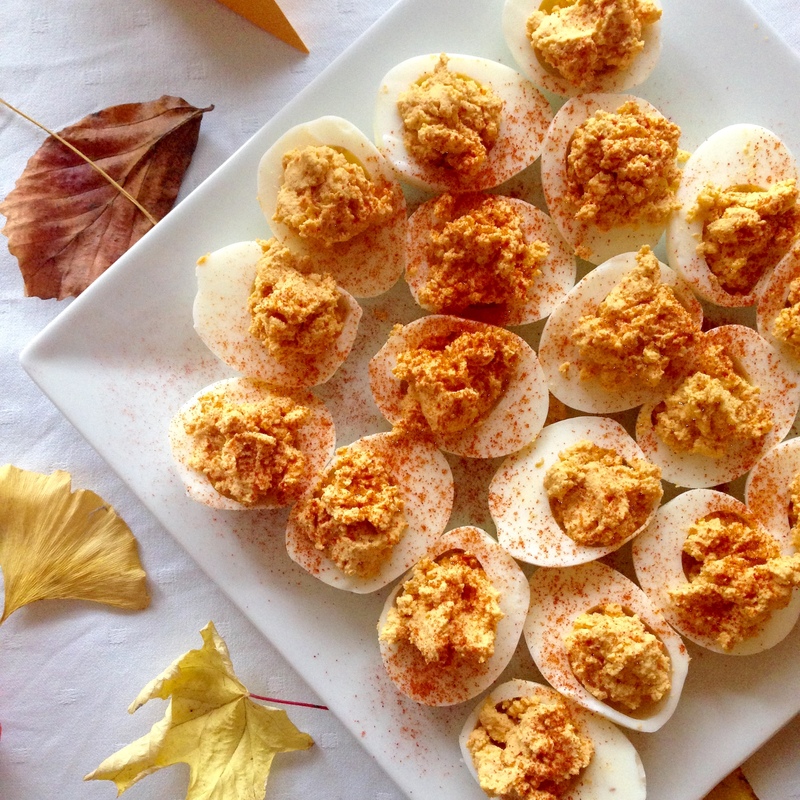 While I was searching the internet for Thanksgiving dinner ideas, Devilled Eggs kept showing up on my feed. Three years ago, I had no idea what that was. Turns out there are different recipes out there and I ended up combining a few, adding the ingredients I like and believe make a good combo. There is no exact recipe, it all depends on your taste. I hard boiled 10 eggs for 8 people, cut them in half and removed the egg yolks. To make the devilled eggs, simply place all the egg yolks in a medium bowl and crush them with a fork. Add about a tablespoon and a half mustard, a tablespoon sour cream, one teaspoon Himalayan salt and half a teaspoon of each sweet paprika and cayenne pepper. Mix well and fill the egg whites with the mixture. Sprinkle with some more sweet paprika and your side dish is ready. 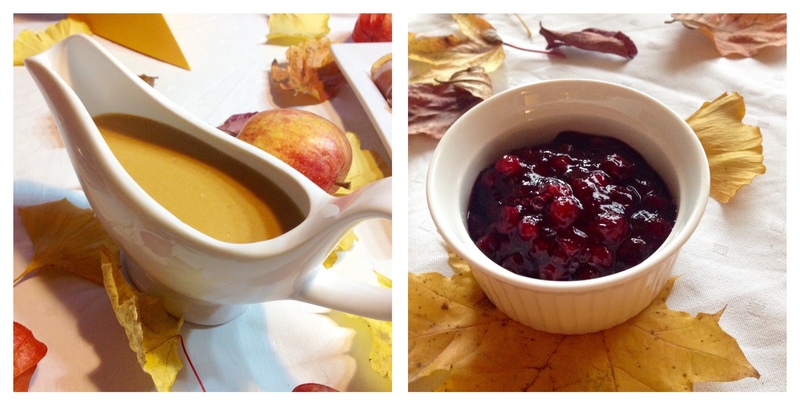 I have to admit I did not make the Cranberry Sauce myself, one of the reasons being that it is hard to find fresh or frozen cranberries around here. Since Thanksgiving is not celebrated in Slovenia, stores do not stock up on all the Thanksgiving goodies and you therefore have to plan way ahead or improvise. I find it that a good quality Cranberry preserve will do the trick and substitute a homemade cranberry sauce just fine. I did however make the gravy. To make the Gravy, add two peeled apples, chopped into four pieces each, and two peeled carrots, chopped into 4 pieces each, to the baking tray with the turkey as soon as you start roasting it. The apples will desolve almost completely after 4 hours of roasting. Place them, together with the softly roasted carrots and some vegetable stock that you have been covering the turkey with, to a tall plastic glass. Using a stick blender, blend the ingredients until you reach a smooth brown-ish sauce. Add more vegetable stock from the roasting pan if needed. 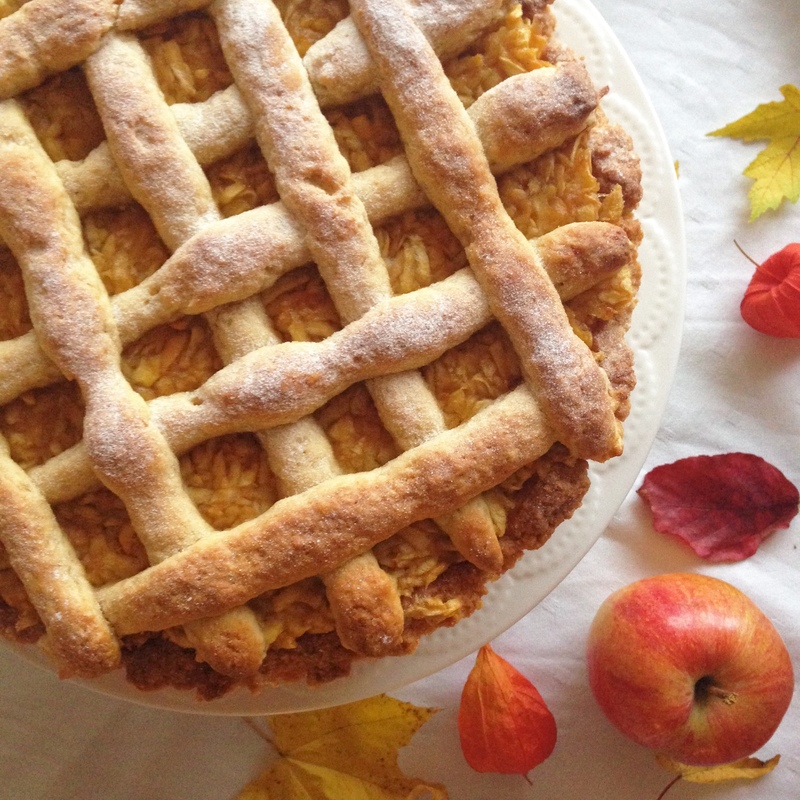 For dessert, I served a delicious Spelt Flour Apple Pie from by previous post. The spelt flour gives the pie an amazing nutty flavour, different from the one regular flour gives. I personally love it. Since I had the oven “reserved” for the turkey for almost the entire day, I baked my pie in the morning and served it cold. If you have two ovens or if you plan to serve the pie on a different occasion that does not require an oven for anything else but the pie, you can of course bake it last minute and serve it hot. It tastes amazing either way.